The Mercatus Center, a public policy research group, ranked the 50 states based on how well each state government planned spending in fiscal 2013 — the most recent year for which data was available — as well as their future financial prospects. from annual budgeting to cash to pay bills, to funding for pensions and long-term plans. There are 30 states still collecting less in taxes, adjusted for inflation, than when the recession hit, according to a Pew Charitable Trusts study that examined the data through September. Income-tax collections grew on a real basis by 7.1% since late 2008, while sales-tax receipts rose by 1%, according to an analysis by Nelson A. Rockefeller Institute of Government at the State University of New York. State and local governments are employing 620,000 fewer people than they did six years ago. New municipal-bond sales stand at a more-than-15-year low as states remain hesitant to start public works and other capital projects. If anyone tells you all you have to do is magically raise taxes and all ills are solved, they are terribly wrong. 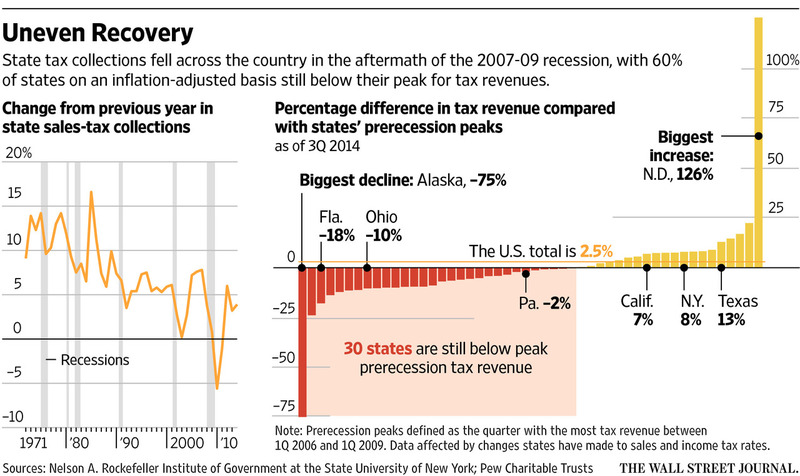 Coming out of the recession, several states raised sales-tax rates to make up for deep revenue drops. In Arizona, a sales-tax increase was only temporary, meant to serve as a three-year bridge until collections returned. Still, total tax revenues as of the third quarter of last year remained 10% below their prerecession levels on an inflation-adjusted basis, according to the Pew analysis. You can read the rest of the Wall Street Journal article here.